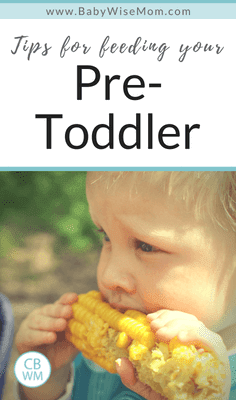 Tips for Feeding Your Pre-Toddler. Tips for feeding your 12-18 month old. What to feed and when to feed. When Brayden got to the age where he was ready to start eating “real” food and not baby food, I was at a bit of a loss. I loved baby food because I could directly control the amount of fruits and vegetables entering his body. I could also easily measure and see how many servings he was getting. Alas, you do have to relinquish that control and let your child feed himself. Some are perfectly happy to continue on into their second year of life eating mushy baby food. Others (like my Kaitlyn) start protesting such things much younger. There are a lot of helpful books out there that offer food advice, and even books made just for feeding our babies and toddlers. We obviously are concerned over the subject 🙂 I would recommend getting a book to help guide you if you are concerned or unsure. 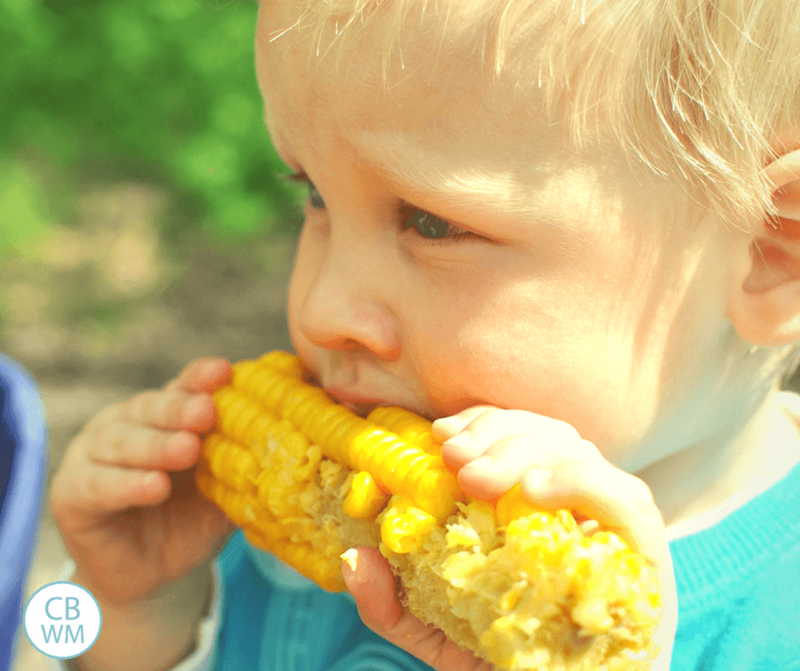 What to Expect the First Year (affiliate) has good information on foods safe for babies. Another book I have heard of, but not read, is Super Baby Food (affiliate). It covers from birth up to 3 years of age. One thing to remember is that most pre-toddlers have a dramatic decrease in food intake around one year of age. This is perfectly normal. “Most babies triple their birth weight in the first year; in the second year they add only about a third of their weight” (What to Expect the First Year (affiliate), p.489). Lunch: green veggie, fruit, and whatever else I was eating. Dinner: Yellow veggie, fruit, and whatever else we were eating as a family. Always be aware of what your child is and isn’t capable of chewing. Cut things up as needed. Also, remember to try to offer all the colors of the rainbow when feeding fruits and veggies to your child. Veggies are more difficult for a toddler because they are hard and not the type of thing you gum unless they are cooked and soft. Once molars come in, things can be chewed better, but they still need to be monitored and evaluated how much needs to be cut up. Carrots cut up to bite size pieces. Note that a carrot takes a long time to chew. Brayden still will stuff his mouth full of carrots and get bored with chewing them. You might have to monitor how many go in if your child doesn’t do it himself. Broccoli cut up to bite size. Tomatoes, diced–I know, they are a fruit, but then they are a vegetable with certain classification rules…I am just putting them here. Do what you want with it. You get the idea. Whatever you eat, you can give your child so long as it is either cooked and/or cut up appropriately. Most kids love bread. I give both of mine wheat or whole grain. Since he started eating real, solid food, Brayden (now 2.5) has always eatten what we are eating. He will eat whatever we eat. I don’t have to make him separate dinners. He eats enchiladas, BBQ chicken, spaghetti with sauce, lasagna, turkey steak, tacos…he eats it all. Yes, we have had our run with peanut butter and jelly being the preferred item, but he always gets what we are having first. He isn’t hungry for PB&J following his meal. He does get it for lunch a lot. Take note that eating peanut butter should be discussed with your doctor before you do it. If you have no family history of allergies, it should be okay after age one. If you do, however, many doctors will suggest you wait until age two, three, or even four. Brayden didn’t start eating meat until he was 2. His doctor was surprised that he didn’t like it when I went to his 2 year old appointment, so I started to get him to eat it. He still isn’t a big meat-eater, and he does fine with protein from other sources. When I cook a veggie or cut up something, I do extra and then store it for a couple of days. I cook extra peas. I cut up extra cheese. And so on. I do this so that I don’t have to do it every day. You can store in a Tupperware or baggie in the fridge. Did you ever try the meat in the baby food jars? My sixth month old is a great eater and follows the same schedule as you do for Kaitlyn. I was just wondering if you have added meat at all?Thanks! I love your blog. Meat is an interesting thing. I have read, and my pedi holds to this, that you shouldn’t introduce it before 9 months. But I know one woman whose doctor recommends it after 6 months.I haven’t ever given jarred meat. I think it is something in my head that jarred meat just sounds gross…:) Of course, lots of babies eat and love it. My son wouldn’t really eat meat until after his second birthday. I started to encourage it when his doctor showed surprise that he didn’t eat meat. He eats small amounts. He gets protein from other sources. Previous Post Poll Results: Did Baby Seem to Experience Any Kind of Sleep Troubles Around 4 Months of Age? Okay, first of all, LOVE the blog! It’s so nice to have someone answering the questions before I even ask them! 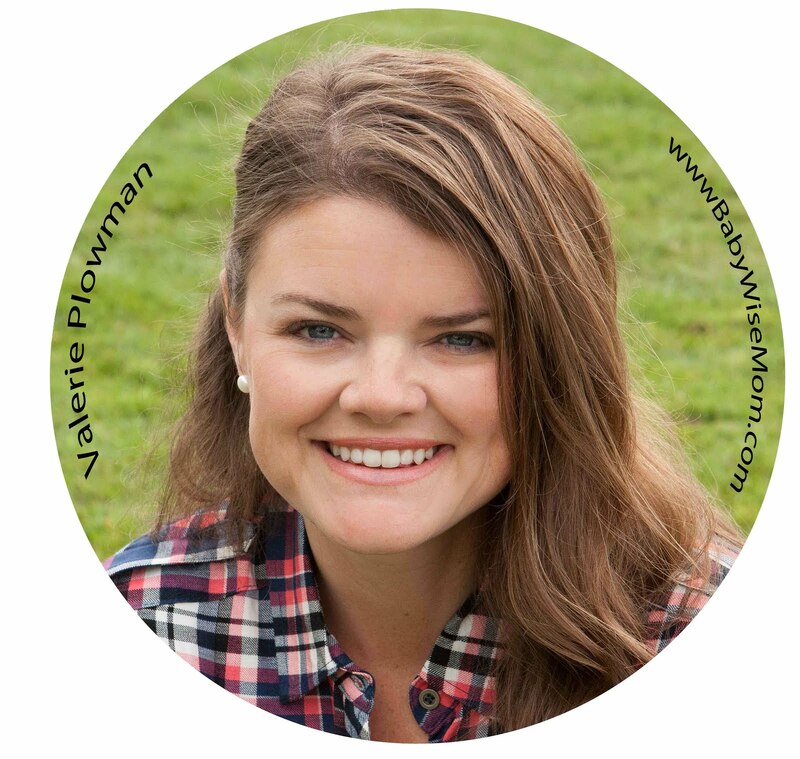 I do have one question though…I’ve started to try to move away from jar food (we’ve pretty much tapped out the stage 3 foods!) but I’m still at a loss about what to give him. A friend gave me a list of foods that she gives, but I’ve had a bit of trouble: for example, – I fed my son (10.5 months old) cut up and steamed carrots today and he kept choking on them (I but them up about pea size)- I also tried to give him an animal cracker but he kept breaking that in two and then choking on the piece. – Last week, I tried to feed him what we were eating (pork) by cutting it up really little (again pea size), but again, he choked. I’m just getting so frustrated, but I know that he needs to move on to actually SOLID foods instead of baby food. Oh, the only thing that he’s been able to eat okay is shredded cheese and pea-sized peach pieces.So, all of that to say, am I missing something???? What am I doing wrong, cause this is super stressing me out. January,I apologize, I wasn’t notified of your comment. I just came across it as I was cleaning up comments.I don’t think you are doing anything wrong; I think your son is just one who is later in eating real food. Some do really well without molars, some don’t. I would try fruits like watermelon that just disolve in your mouth. Bananas would also be good. Have you tried with the gerber rice puffs? Those are good practice. Carrots can be hard–even cooked. I only feed babies carrots from the crock pot. Start small, then move up. He will get it. Ever since I started my LO on solids, he has gotten a little rash on his back. It doesn’t matter what veggie or fruit I try. There are no other symptoms. They are like little eczema spots on his back – 4 of them. I don’t know what to do. I don’t think he is allergic, as it’s all solids, and I don’t want to stop him on solids as he is 6mo.Do you think it could just be that his body needs to get used to the new ingredients?? I think I would have a doctor look at it. A doctor should be able to tell if it is a reaction, virus, or other. Valerie,When you say that Brayden ate what you ate, what age was he? Mine is 9 months and I’m ready to move on from jarred foods. But I don’t know if I should separate his foods from ours b/c of onions, garlic, spices, etc. What do you think? I made minestrone soup from scratch and I think it should be ok but it has some of the above ingredients. Also, with cooked meats, would you suggest throwing it into a blender or processor? I made a turkey lasagna over the weekend but I’m not sure what to do with the chunks of meat.Also, is a growth spurt around 9 months usual? It seems like my son is now drinking closer to 32 oz. (instead of 28) of milk and is just chowing down solids with no end in sight. I have no idea how to know when he’s truly full! I’ve tried teaching him some sign language to get a better idea but he just smiles at me. :)Thank you! I am having trouble with my daughter, Addalyn. She just turned 1 New Year's Eve, and she still loves her mushy stage two baby food. I can't get her to eat stage 3 foods at all, except for the fruits. She will eat crackers, baby mum-mums, gerber puffs, biter biscuits, zwieback toast, and try bites of stuff I eat, but when it comes to diced up fruit or veggies, she will not eat it at all. We are still doing stage 2 green beans, fruits, and meats…is there something wrong? or should I be trying something else?>>> HELP! srwe14,Kaitlyn never went to stage 3, so I wouldn’t worry about that. Take it easy and slow. Brayden was more like 14 months when we moved away from baby food and more toward eating what we age. Kaitlyn always hated baby food and was ready before age one to drop baby food.A nice thing about the baby food is that you can have more control over what and how much she eats :)I wouldn’t stress about it. Keep offering the bites of real food, but she will let you know when she is ready to move forward. Thanks Valerie! I did get it figured out but I do have another question. By age one, how much whole milk would a pre-toddler drink? It seems like my one year old isn’t interested in drinking his usual 28 ounces of milk like he did on his 4 hour schedule. Should we transition him to just 3 meals a day with drinks like we do? I also am having trouble transitioning to a sippy cup…any thoughts? Valerie, could you please address my comment? I am srwe14 with Addalyn who is a year old….it’s just below Susanna’s comment…Thanks, it would be much appreciated! srwe14, If you look, you will see that I did yesterday. Just an interesting culture difference. I live in Brazil and here most pediatricians recomend meat right after introducing fruits and veggies. So at 5 or 6 months we start with fruits, than at around 6 or 7 we start with veggies and meat too. My son (now 14months) has been eating meat since 7 months. We usually make a soup with many kinds of veggies plus meat. We blend it all or just smush the veggies and blend the meat. It’s interesting to see the difference in cultures. Considering that BW is really based on full meals, and no snacking – I’m interested to see how other BW moms handle snacking and juice?? ?Also – I know every baby is different, but just to get an idea – if any of you have a 13 month old boy (or around there), how much solids is he getting a day? And how much liquids? bradysmom, I have a 13 month old girl and we do a baby food of fruit with a few tablespoons of oatmeal for breakfast, a baby food of veggies with oatmeal (plus some of what I’m eating) for lunch, a snack of a few crackers or yogurt to tie her over until dinner, and then she eats what we’re having for dinner (no idea how much really–until she’s done). She’s drinking 18-22 ounces of milk each day, some water while we run errands, and we haven’t given her any juice yet.The only snacks we do are the one in the afternoon, which isn’t that big, and then I give her crackers to distract her while I run errands, and that is usually after lunch anyway. Thanks Cristine. I always love learning about other cultures. Bradysmom,Snacks…I think most do at most one snack a day. But I never did a snack until the child had dropped down to one nap a day.Juice…most BW moms I have talked to about it don’t do juice at all. Some need to for constipation issues. We don’t drink juice around here; we literally drink only water and milk. But if you want juice, that is fine, just don’t over-do it. At 13 months, Brayden had 24 ounces of milk a day. I am not sure exactly on the amount of solids. He was really good at regulating himself.Thanks for sharing your thoughts Jennifer! I also would do crackers or something if needed while running errands. Thank you for the info! That’s pretty much what we’re doing, so I’m glad to hear that. My LO is 11 months, and I'm wondering when I should be transitioning to 3 liquid feedings a day (he is currently at 4…7, 11, 3, 7). Which feeding is best to drop and how do you know when they are ready? He will drink 25-27 oz per day. He is still having issues with eating more solid food, but he is still eating purees after his feedings at 7, 11, and 3. I have a post on that–"aligning meals with the family." Hello! So my 8 month old daughter won't take spoon fed foods anymore and only wants to feed herself. She's on the small side, so I'm worried she's not getting enough solids when just doing finger foods. We've been doing a lot of high fat stuff, but she's also started waking in the night again once and won't go back to sleep without a bottle. I worry it's because she's not getting enough calories. Any suggestions? Thanks!